Here are some happy fishermen with their catch today. Here are some of our shanties and the bob sled used to transport people out to them. 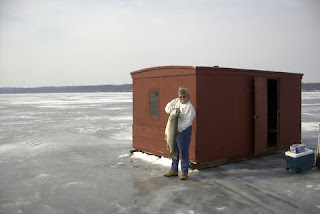 The ice conditions are now good over trout fishing areas. We have shanties out and are ready to go fishing. THE LAKE IS ICE COVERED ON THE EAST AND WEST ENDS ONLY. THE MIDDLE OF THE LAKE OVER DEEP WATER IS STILL OPEN. 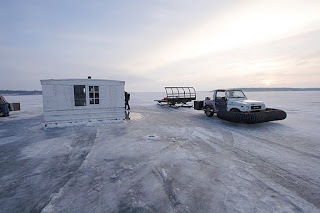 WE WILL ATTEMPT TO BE UP AND RUNNING WITH THE SHANTY RENTALS BY THIS FRIDAY JAN. 15TH. As of today Jan. 7 2010 the eastern 1/3 of Big Green Lake is ice covered. The ice is thin and now has a covering of snow. I will continue to monitor the ice conditions and when they improve, I will report it on this blog.